Inder Loves Folk Art: Hummingbird skirt. Still sewing for myself over here! 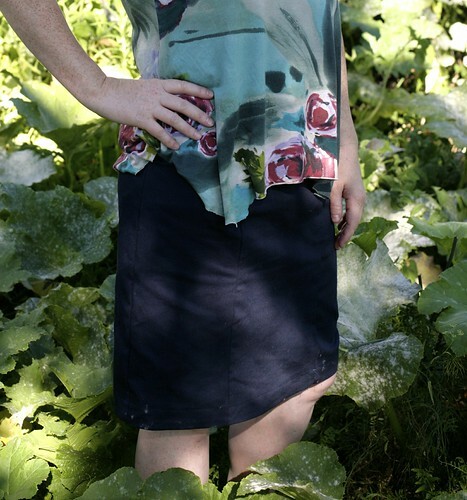 And still taking photographs in my "romantic" squash patch (we're getting some mean powdery mildew - might be time to find a new photo shoot location, some of it rubbed off on my skirt, blech). This is a really basic, almost boring item. 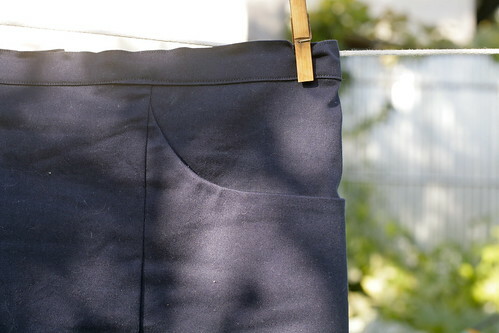 A straight navy cotton twill skirt. It doesn't photograph (or blog) particularly well. But I am thrilled with it. It may not be exciting, but I am going to wear it to pieces! As Steve said, "You can even wear that to work!" Yes! And that is high praise indeed! 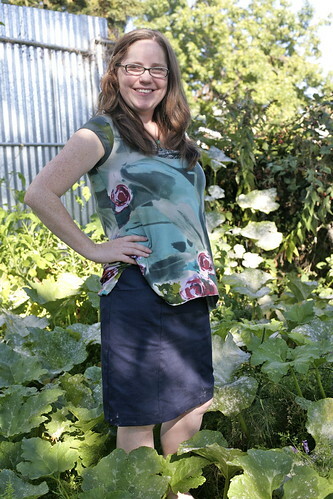 This is the "Hummingbird Skirt," from my new favorite pattern maker, Cake Patterns. I love Cake for a bunch of reasons: (1) No sizes, just measurements; (2) Everything is intended to be altered, and the instructions walk you through that; (3) Cute styles; (4) Styles that call for knit fabrics as well as woven (I do love to wear knits); and (5) Pockets. Plus, the printed patterns are sturdy and feel good and have great illustrations (by cartoonist and sewing blogger Mikhaela). 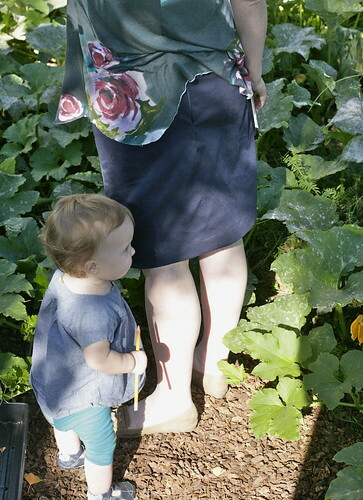 Incidentally, this is one of my favorite tops, from Anthropologie a couple years ago. I have worn it so much, and it's beginning to show its age. It is a simple drapey knit top, with cap sleeves and a light voile woven neckline (a bit cowl-like). The hem is raw and unfinished.When it finally breathes its last, I think I'm going to cut it up and try to copy it. It is so flattering and comfortable and easy to wear. It will be hard to find knit fabric half as lovely as this, though! Back to the skirt, this was actually intended to be a trial version of this pattern. I have some gorgeous mustard linen/rayon that I want to use to make the version of the skirt that has a back flounce (drool), but I wanted to try out the easier and simpler straight version first. And I am glad I did a trial version because I did some major alterations on this baby! Alterations that went above and beyond the alterations described in the pattern, that is. So ... right now I have a post-baby tummy, but I've always had pretty narrow hips, and not much in the rear at all. So my waist-to-hip ratio is like, um ... practically 1:1. With more curves in front (tummy) than back. Hey, it's nothing to brag about, but I know I'm not alone with this problem! I am hoping to lose some of this baby weight, but you know, I'm not planning to do anything freaky like go on a diet (shudder). It's a good body and I might as well try to make the best of it! By the way, I hate the term "apple" to describe a woman's body shape. Could someone please come up with a less, um, completely shapeless term to describe the normal and perfectly fine shape of many women after having a kid or two? Thanks a bunch! The best thing about Cake Patterns is that they don't use regular sizes: rather, you cut out the pattern based on your measurements. And the measurements come in a huge range. I really can't overemphasize how fantastic this is. But, nonetheless, in comparing my measurements to the pattern, I learned that a 1:1 waist/hip ratio isn't really one of your options. The pattern is definitely designed with more of a pear shape in mind ("Pear" seems so much nicer than "apple.") So I cut out the waist based on my measurements, and cut out a larger size in the skirt pieces, knowing I would have to scale it down around the hips. I spent some time basting and trying things on until I got things right. One of the biggest changes I made was to reduce the back darts almost to nothing ("essence of back dart," anyone?) because I don't have many curves back there. The darts provide a tiny bit of shaping, but not much. Then I took the side seams in a lot - more in back than in front. This worked well and the fit is pretty good back there now! At this point, I allowed the baby into the shoot to distract you from the fact that I am posting a photo of my derriere on the internet. Man, I struggled with the invisible zipper this time. 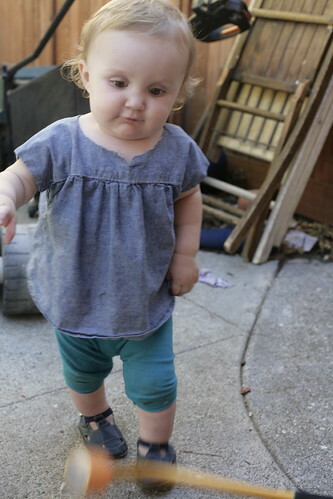 It's not perfect, but look, Maggie is walking all over the place now! Here are some obligatory detail shots. 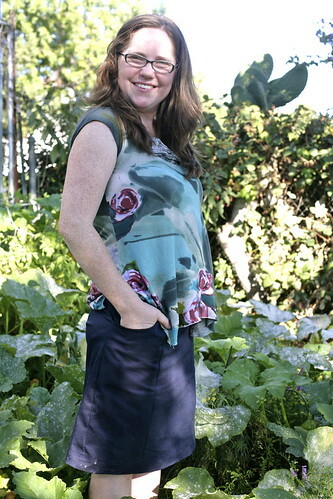 I love the pockets on this skirt - they are deep and generous and practical. I like to put my smart phone in my pocket when I go to meetings - you never know when you will need to check your calendar or shoot off an email or kill time surfing Etsy while you wait for everyone to show up. What did we ever do without smart phones? Anyway, this is a deep and secure smart phone pocket. 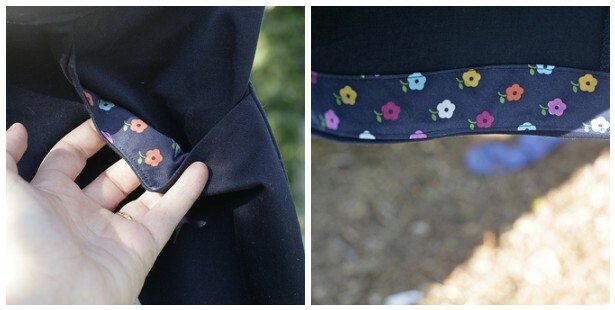 I faced the pockets and hem with some scraps of navy floral that were given to me as part of a "scrap exchange." Actually, the stretch navy twill was also a gift from a sewing buddy! So this skirt was made entirely with gifted fabrics. When I wear it, I will feel extra blessed by my great sewing friends! One of the reasons I used the hem facing is that this version of the skirt is pretty short. I am only 5'4", and I don't have long legs, so I am pretty used to everything being a bit long on me. Not this skirt. I imagine that on a taller woman, it would be almost scandalous! The hem facing allowed me to use only 1/4" of the hem and keep the length. Even so it hits just above my knee. So if you decide to make this pattern, keep that in mind. Of course, I wasn't too disappointed to have to use hem facings - it is one of my favorite finishes, as you know, and the contrasting fabric adds a little personality to a very basic skirt. Some parting shots of Maggie in her mama-mades. She is quite the toddler now! She has even adopted a blood curdling scream for times when she doesn't get her way. When you hear it, you would imagine that she has been horribly injured, but no, it usually means that someone has told her not to play in the dog's water bowl, or to stop eating Joe's crayons. She's starting to let her desires be known, shall we say. She's still pretty small, though. Definitely less than 50th percentile, and a whole lot smaller than Joe was at this age (he was a big, big boy). Remember that top? It still fits her! And she's still rocking her owl Fancy Pants too. I have made her quite a few things that are still too big for her. 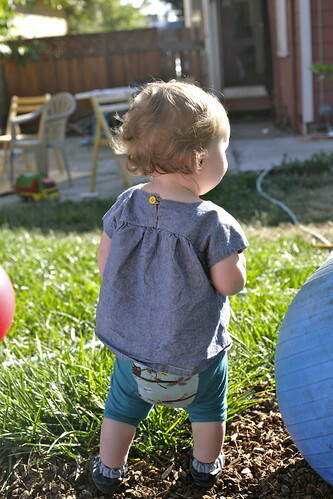 Once she finally starts growing out of her 6-12 month sized stuff, I will probably start sewing for her again. But for now, she actually has a lot of home-sewn items, and I am enjoying learning to sew for myself! Nice skirt Inder! I've been thinking about trying a cake pattern but trying to resist the ever-growing pattern stash - oh dear! And Maggie looks just too cute. One of my girls was quite little as a bub too but she's catching up now. That's the perfect anytime/anywhere all-occasion skirt, and that measurement system seems highly sensible. I need to make a few wardrobe basics like that for myself too, but R's back-to-school sewing needs are many. I did lose track of the skirt when Maggie entered the frame! I'm slowly learning that sometimes the things that seem like the most "boring" to sew are often the best to sew because they'll actually get worn a ton. In my case I'm always drawn to buying crazy patterned fabrics but the fact is that I don't always love to wear such crazy fabrics and so I'm trying to buy more solids since they are far more practical in my life. This skirt really is amazing and the fit is right on (which I am always so impressed with)! Nice work!! I love the fact that two inches above the knee would be scandalous. Nice butts! Hows that for a classy comment. Seriously great skirt. i love reading your posts so much and especially love that they come on the weekends! i usually read them while i nurse zee babe down for her nap. first, the "romantic" comment is still making me laugh a day later. and thank you for mentioning the powdery mildew. i now know what's on my squash leaves! i have never had luck with squash here at all. this season, i planted two tranplants, both died. our dog got our third transplant and chewed it up, so i threw it into our backyard trash bin. our ground is so hard and it's very hard for me to dig deep enough for the transplants so i thought it didn't stand a chance. a week later, it was still growing. indigo took it out and planted it herself, not even deep, in a raised bed with my herbs - and it's doing f a n t a s t i c a l l y! that plant had a will to survive! you did an amazing job on all of these details. your skirt is beautiful and very professional looking. When I was working up the pocket design, I absolutely had to have a secure smart phone pocket... I'm so glad you like it! Thank you for designing such a great pattern, Steph! I have been wearing this a lot and am looking forward to making a "flouce" version! the skirt looks fabulous, and Maggie!!! oh, growing up so fast!